As expected, I have been running around town since I returned to Dubai a few days ago. Things pile up when you go away for a month, and even more so when you run a few bakeries. But I don't mind at all, I was quite excited to do the school run again after that long and gorgeous holiday. Having said that, I still didn't get the chance to upload my images, but I promise I will do so as soon as I can. In the mean time I will leave you with the sweet ending to the French menu I started sharing in earlier posts. 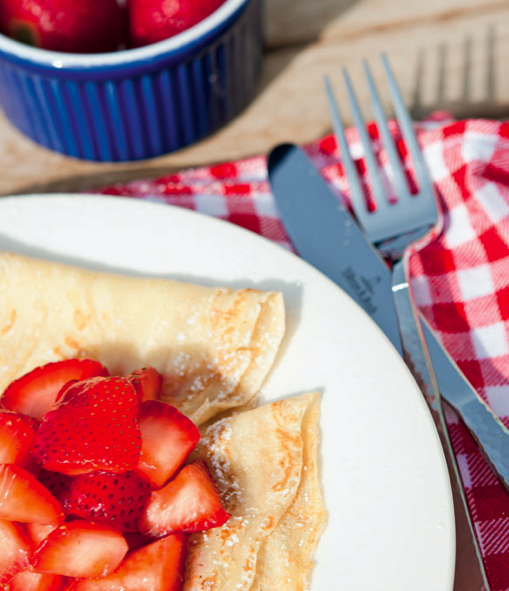 Crepes with Sour Strawberries, a true delight! For any of you who are in Dubai and have little ones, Kitsch Cupcakes is holding "My little Cupcake" workshop at Burjuman over the weekend. It's free of charge and allows your munchkins to decorate their own cupcakes. I'll be there with my little Phares and hope to see some of you lovely mommies there too. Off to dinner at Roberto's in DIFC to catch up with friends I haven't seen in a while. 1. Mix the strawberries with lemon juice and set aside. 2. Using a whisk, cream the egg, sugar and salt. Add the flour and milk alternatively. 3. Finish by incorporating the melted butter. 4. Heat a nonstick pan on medium heat. Melt a small knob of butter, then pour one generous soup scoop of crepes batter and fry for a minute or so on each side. 5. Top with the berries and a generous sprinkle of icing sugar. Delightful!